Daily Magic Productions presents the next haunting installment of the Harrowed Halls series! 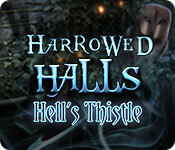 Harrowed Halls: Hell's Thistle is rated 4.2 out of 5 by 19. Rated 5 out of 5 by blackblack100 from Dark Creepy Fun Based on completing the Standard Edition game. To set the record straight ... the game is not for everyone. Just know what you're getting into. There are definitely adult themes present, to include psychological angst, marital infidelity, and other topics that are not appropriate for young audiences. But that's not a reason to give the game a poor score, when more mature players will find many appealing qualities. 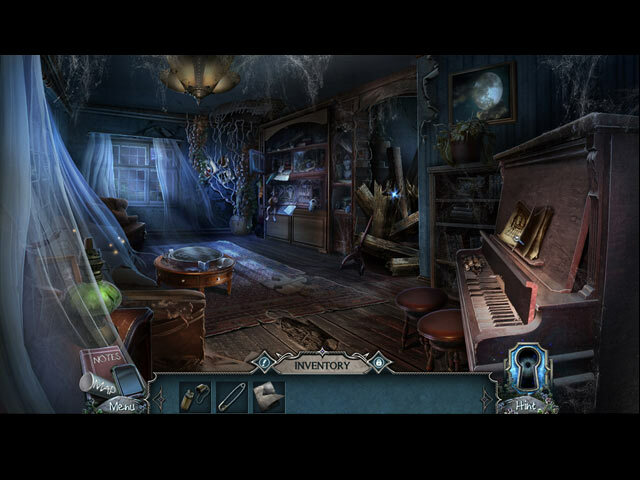 Far more puzzles than most hidden object games. Varying degrees of difficulty ... on average being a bit simpler than most in games of this type. HOP's are varied and original. Interesting story line that maintains cohesion. If these things appeal to you, you've found a game that's well worth the time and cost. Great graphics and sound quality. Lots of cut scenes which are clear, well done and pertinent to the plot. Rated 5 out of 5 by denniann2 from a wonderful HO game has a custom level and a great hint system. it's about a ghost that is inhabiting a house that doesn't want to let you leave. you do find the girl in there that the ghost took. i had to skip some of the mini games, but that is me not the game. Rated 5 out of 5 by tophatmcgee from Excellent addition to the series, keep 'em coming! Harrowed Halls has got to be in the top 5 series that Big Fish offers, I just wish that there were more stories. They didn't skimp on the size, the game is nice and long. Major creep factor, had me jump in my seat a couple of times. The only downside that I can come up with is that some puzzles were a little too easy. I wish that they used the hard and easy versions. The story line is great, the visuals are top notch, even the audio is far from run of the mill. Two big thumbs way, way up, I heartily recommend this game! Rated 5 out of 5 by 5Jodi from The Bad Seed? Excellent game - very spooky, a storyline with creepy twists and turns, games that are not overly hard and yet fun to play. Enjoyed the whole game and could not wait to play it. A more adult game. and super enjoyable! Rated 5 out of 5 by juliedv5 from Loved it! I loved the first one (lakeview lane) but this one is my favorite. They upgraded the visual quality and the HOP have more challenge and originality. Can not wait for the next one! Rated 5 out of 5 by orijojo from Amazing Game. This game is extremely good, I give it 5 stars on all levels. Highly recommended. Rated 5 out of 5 by aysgu from At Last! For a long time, I haven't played such a fun game. Everything about it was so good... I definately recommend it. Rated 5 out of 5 by SparkleGlow100 from Amazing graphics Artsy and stunning environments! This horror game is cut above the rest in that there's so much detail in every single scene. Just take a look at the sample scenes posted! It really is that good. The story is very well thought out because you just get deeper and deeper into the mystery. I felt that there were no cheap tricks used, or short-cuts to get the horror vibe. Yes, and it is horror. Very creepy and ghostly. Wow, just recently the graphics have really turned up a few notches...across the board! Rated 5 out of 5 by biscuitsmama from EXCELLENT GAME AND A PUZZLE LOVERS DELIGHT This is the second game in the Harrowed Halls series and in this one you play the game as Rick whose sister Dana collapsed one evening after work and is now in a semi-coma. When you arrive at the hospital she keeps repeating that “it is calling her back”. You know that she is referring to the old house that you and Dana explored when you were kids; an adventure that could have been deadly had you not run for your lives. Somehow Dana in her subconscious seems to hear that old house, or whatever evil resides in it, calling to her. Now it seems that you must confront your fear and re-enter the house after all of these years. Hopefully, by finding what lies hidden in that house, you will be able to save Dana. 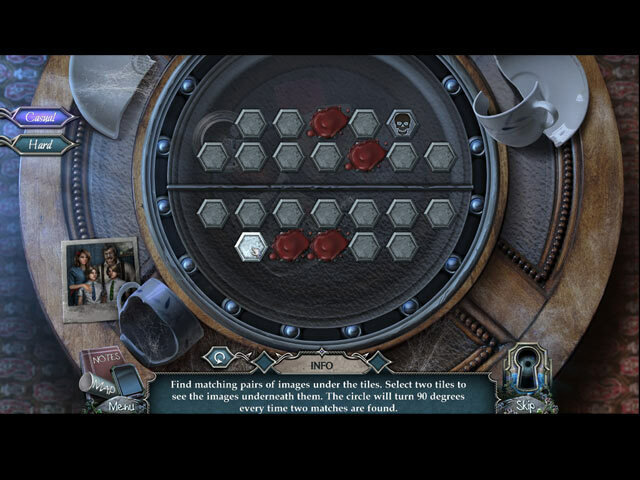 The game is very creative and the HOPS in this game are used to move the story forward. Even though a lot of the HOPS are the storybook type, they are very interesting and well-designed. I am not a huge fan of the story type of HOPS but in this game they work. There are some terrific puzzles in the game but IMHO, there are maybe too many puzzles in the game. Sometimes it felt like the puzzles outweighed the storyline. In this case the story is so good that I wanted to find out more and quite frankly I felt that having to stop and play a puzzle, no matter how good, interfered with the game’s momentum. I was disappointed that there is no replay of HOPS or of the puzzles in the game – mainly because I wanted to skip some of the puzzles in order to move forward with the storyline, thinking I could replay them in the extras but that is not an option in this game. This second game in the Harrowed Halls series is excellent and one that is very fitting for the upcoming Halloween celebrations. There are some great jump-scare moments and one that I really didn’t expect at all. I love the game and think it is destined to become a Halloween classic and one that many of you might like to replay each year. Even though I found the game close to being perfect, as always, I recommend that you play the demo to see if it is one you will enjoy. Happy gaming! Rated 5 out of 5 by charlene_lane from SAVE DANA REVIEW FROM COMPLETED GAME AND BONUS This is a very enjoyable game with plenty to do in each scene. There is: * Voiceovers (with dialogue); * Casual, Advance, Hard and Custom modes of play; * Interactive map; * 17 Achievements; * Notebook. The graphics are not bad but it is very dark in most scenes. However, it is an old house with lots of ghosts and creepy sounds to keep you company, so I suppose it has to be dark to add that ambiance to the game. Sound is good and the music is orchestral and piano. 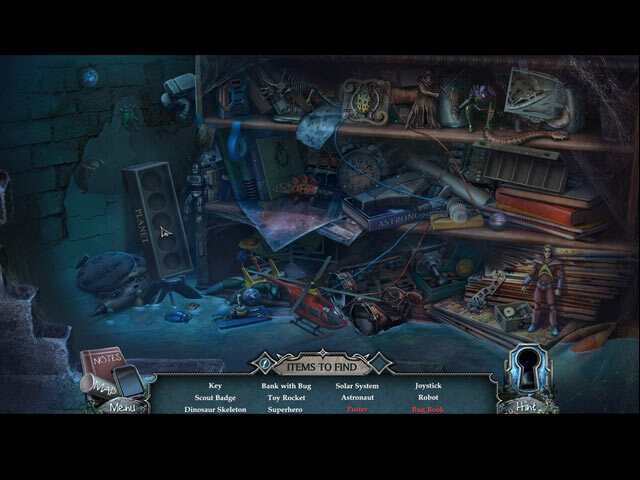 The hidden object games are mainly interactive straightforward which you will do twice. These are easy to do and each one only takes a couple of minutes. Items are clear to see. There are a huge range of mini-games and I enjoyed them all. These ranged from easy to medium. There are a few of my favourite ones in there as well. None are too hard or boring and I'm sure you will be able to conquer them all without any problem. You also have a cellphone with apps to help you. This does not hinder the game in any way and it was fun using it. So do you get the CE or SE? In the CE there are 72 morphs to find in the game and bonus (puzzle pieces), Collections, finding and collecting coins to play some extra mini-games (these are fun to do) and all the usual extras and bling we like. All up the game and bonus took me about 5 hours to play. I took my time as there was lots to do and it wasn't always obvious what to do next. I enjoyed that. Overall, a fabulous game and well worth putting in your collection. Happy playing fishies. Can you solve an old murder case and save your sister?